Who doesn't fancies with the cutie tutie items? Yes, every one is fond of the tiny things in the world. 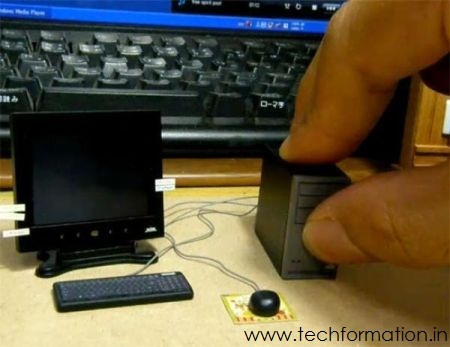 And that too a tiny desktop? You will fight to own it. What you are seeing is the real desktop computer with monitor the size of a match box and a CPU the size of an eraser and the tiny mouse the size of a ground nut. And a tiny keyboard with all ASCII keys. You will be amazed to know that this runs on Vista operating system. You can view photos, videos and even presentations! You can even browse the internet too!! I'm not joking..